When shopping for an ergonomic chair, the choice you make should depend on whether you're choosing a chair for all the employees in your company, or whether the chair will be for your own personal use. For a group of employees, a traditional chair should have enough adjustable functions to provide most of them with the best ergonomic adjustment possible. If you're the chair's main user, however, you should choose ergonomic options that specifically benefit your own posture and personal comfort level. Are you sold on the advantages of having an ergonomic chair but don't know how to choose one? Here are the most important points to consider in your selection. An ergonomic chair should allow you to move freely and with a minimum of effort. Proper adjustments should let you work from a comfortable position that reduces fatigue as much as possible and helps you avoid injury while stimulating circulation and the maintenance of good posture. 1. Head rest: The head rest supports your head and allows you to lean back. It relaxes the muscles of the head and neck, even after long periods of sitting. 2. Lumbar support: Lumbar support is one of the most important ergonomic choices. Choose to have the firmest support possible and the option to make adjustments. Lumbar adjustment is usually up and down but is also available forwards and backwards to adjust to the natural curve of the back. 3. Armrests: Armrests reduce tension in the shoulders and arms. Depending on the chair and the user's posture requirements, they may be height-, width- or tilt-adjustable, and so forth. A comfortable working position is when the arm forms a right angle and the wrist is aligned with the forearm. 4. Seat: Adjusting the seat height lets you configure the chair to the length of your legs. The seat pad fill and covering are also important. Choose a firm seat and a non-slip leather or durable fabric cover. The front of the seat should be contoured in order to promote circulation in the legs. 5. Adjustable height and tilt: Look for a chair that allows you to adjust height and tilt tension according to the user's weight. 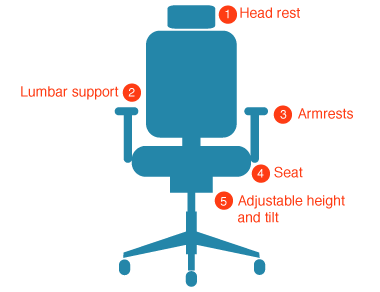 The standard tilt point for office chairs is located under the centre of the seat. If your budget allows, choose a synchro-tilt or knee-tilt mechanism. A synchro-tilt mechanism synchronizes the seat's tilt movement with the movement of the backrest, while the knee-tilt mechanism lets the chair tilt from under the knees rather than from the centre of the seat.